Secondhand tobacco smoke is a greater danger than you might realize. It kills about 50,000-60,000 Americans every year–more than car accidents and murders. It has been estimated that treating these illnesses costs over $6 billion per year. The US Surgeon General has determined that breathing any amount of secondhand smoke is unsafe. Breathing even small amounts of tobacco smoke causes immediate harm to the heart and blood vessels. We support policies that prohibit tobacco use in outdoor areas including public parks, beaches, play grounds, clubs, and outdoor areas of businesses. Talk to officials in your town about prohibiting or restricting smoking in public areas, such as parks. Talk to businesses about not allowing tobacco use on their property. If you are a business owner or landlord, you have the right to prohibit smoking on your property. We can provide you with free signs, while supplies last. Click here for information, or contact us for technical assistance and support. 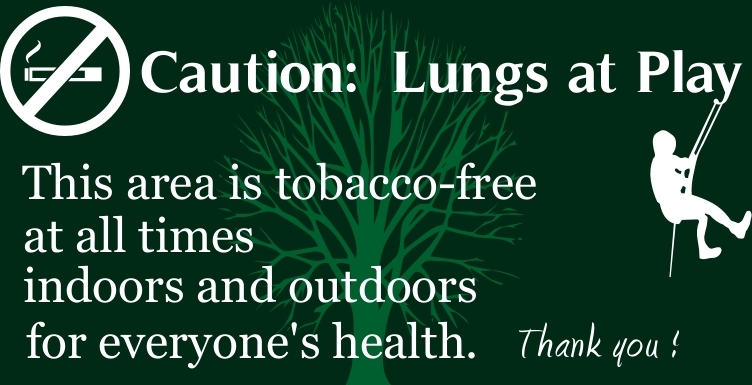 Thank local organizations that have restricted smoking and tobacco use on their property. Don’t let anyone smoke around you, your family, or your pets. It is not impolite to ask someone to not smoke around you. The law prohibits smoking in indoor workplaces. If you see someone smoking in such an area, alert the manager or ask the person to stop smoking. You have the right to report this to the authorities if you wish. This can be done at www.smokefreeNY.org/violation.php. Grounds of public schools are tobacco free by law, indoors and outdoors, at all times (even if school is not in session). If you see someone using tobacco products on school grounds, report it to school officials.